Okay, here we go. So I set up this blog when I was waiting to see if I would get a book deal myself. It was a place to put my writing while I wondered (read: paced, worried, chewed nails) what was next for me professionally. In an instant, it became so satisfying to write about the books I loved as a child, the books I read out loud to my children now, and the ideas and emotions stirred up nightly by books written for and about the lives of children (and also, highly imaginative Siamese cats. I’m looking at you, Skippyjon Jones). The idea for the blog was the books and the characters that lift us up—having taken inspiration from Ramona and her Father and those mood-altering tin-can stilts. I understand this so well because my own daughter outgrew chapter books as fast as she grew into them, trading in her Cinderella Smiths and her Clementines and yes, her Ramonas, for Wonder and Out of My Mind, and book after book that resonate with her the way The Trumpet of the Swan stayed with me. And the thing is, I am—so far—a chapter book writer. I write essays for grown-ups, too, and I have one or two middle grade novels in the works, but my own chapter book series is special to me because it is special to the kids who read it, if only for a split second of their accelerating, warp-speed little lives. 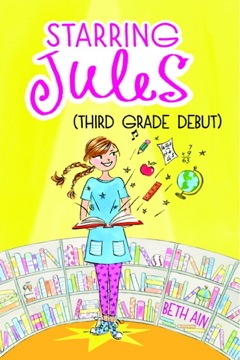 These kids see themselves in Jules. The same way I understood how singing “99 Bottles of Beer on the Wall” at the top of her lungs in the rain while clunking down the street in tin-can stilts, lifted the bad mood right off the shoulders of my beloved Ramona, these kids understand what it feels like to over-think, to worry, to be talented even, and not know what to do with it. The same kids who are bursting with creativity and stories and who think their little brothers are not so terrible, and the ones who adore their parents and their teachers but who are terrorized by behavior charts and the possibility of vomit. This is the stuff of early elementary school and early family life and it is meaningful. I have never written here about my own books because it seemed self-serving to do so. But the time has come. (And frankly, no matter how much I beg, borrow, and steal. And beg. Did I say that? No one else is doing it.) I want kids to read these books and I want teachers and librarians and parents to read them too. So much so, I made a video trailer to rope you in! They are for everyone. There are four of them now. Check them out of the library! Introduce them to your school librarian! Pick one up at your local indie bookseller! (Okay, go easy on yourself–buy them online!) And then share them with the early elementary kids in your life who I think will see themselves somewhere inside, and please while your there, say this to your young reader: write your name on the flap.